As you travel down river the crystal-clear Kvichak River (pronounced Kwee-Jack) about 4 miles from majestic Lake Iliamna, Alaska’s largest lake, you will find Alaska Sportsman’s Lodge nestled intimately upon the ridge overlooking this vast pristine wilderness of south western Alaska. This area is known throughout the world as the pinnacle of sport fishing for the large rainbow trout. Here snow-fed streams flow crystal clear from the mountains through the tundra into Bristol Bay. The nutrient rich environment and pristine habitat provides the perfect setting to host the largest salmon runs in the world as well as providing an abundance of food sources that allows for the rainbow trout to grow larger than 30” in length. Bristol Bay in known for its huge rainbow trout. This beautiful specimen was caught on Moraine Creek, which is one of Alaska’s most popular fly-out options. 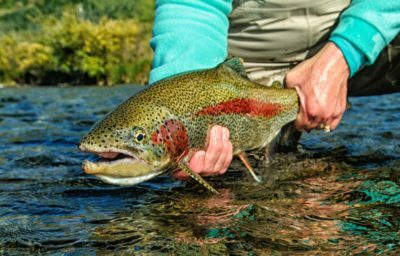 For 9 years in a row, The Blue Quill Angler and Alaska Sportsman’s Lodge have teamed up to provide a spectacular and inspiring fishing adventure during the absolute best time of the season to target these trophy rainbow trout. Our trip this year was another exceptional experience! Our group included 15 guests from all over the United States. Many of them, have returned to the lodge for their second visit! Brian Kraft built Alaska Sportsman’s Lodge in 1997 with the goal of putting a lodge on the best rainbow trout river in the world as well as being closely located to many nearby fly-out streams that can be easily and quickly accessed with the lodge owned float aircraft. Kraft and his staff are dedicated professionals that make sure that every detail is looked after and that no corners are cut in regards to customer service for your trip. The fishing resource of this area takes care of itself, but what makes your trip truly an experience to remember is the people and the lodge. Limited to 22 exclusive guests, Alaska Sportsman’s Lodge prides itself on providing quality fishing experiences each and everyday for our clients. Whether you choose to explore the wonders of the Kvichak River right out the front door of the lodge by boat or you take a fly-out in Katmai National Park through some of the most rugged and pristine wilderness Alaska has to offer, your day will be filled with tremendous fishing, breathtaking scenery, and professional people that are dedicated to making sure that you have a great day. 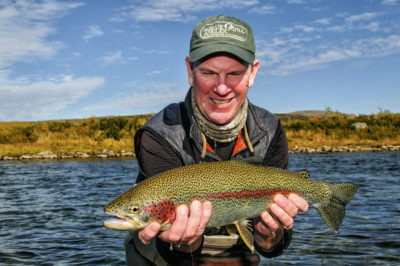 This beautiful rainbow was caught on the Kulik River. The Kulik River is known for its exceptional rainbow trout and phenominal bear viewing. A typical week includes fishing the Kvichak a couple times and flying out to a variety of close by streams. Favorites include Moraine Creek, Little Ku, Brooks, Kulik, Copper, Talarik Creek, Ugashik Narrows, and the Swikshak. There are more options than time when you spend a week at the Alaska Sportsman’s Lodge. Next years dates have been set and we are already counting down the days until we visit Alaska Sportman’s Lodge. Depart Anchorage at 4:30 p.m. (Charter flight between Anchorage and the lodge is included). Arrive to the lodge and enjoy a wonderful dinner. 6 nights accommodations and 6 days of fishing. Depart the lodge after fishing on the 15th and be back in Anchorage at about 7:30 PM. All of the pricing includes air transportation between Anchorage and the lodge, one guide per two anglers, fly outs, all necessary fishing gear, flies, leader material, fine dinning, beer, wine, fishing license, bed taxes, National Park Service user fees, land use fees, processing of any salmon kept including an airline approved wet lock box for the salmon, and daily cabin cleaning. Travel between Anchorage and your home, gratuities (generally 10-15 % of your package price, pooled and split amongst the staff), and liquor.